WATCH: Cameras Capture Corvettes Being Sucked Into Sinkhole : The Two-Way Surveillance footage shows the floor opening up beneath some of the iconic cars at the National Corvette Museum in Bowling Green, Ky. Other videos, taken with cameras mounted on a small helicopter, show what it's like down in the pit. 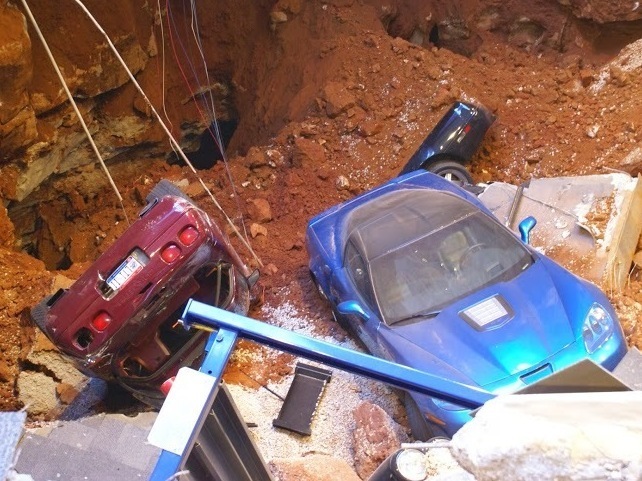 Security cameras were rolling Wednesday when a sinkhole opened up underneath the National Corvette Museum in Bowling Green, Ky. As we reported earlier, eight of the iconic sports cars were sucked down into a hole about 40 feet deep. The museum has now posted videos of the hole opening up, the cars disappearing and what it looks like inside the pit. The museum's YouTube channel is here, and we'll embed several of the clips, which include different views of the collapse. Meanwhile, The Louisville Courier-Journal says there's no timetable at this point for when the cars will be removed from the hole and repairs are made to that wing of the museum. Engineers need to be sure it's safe to work inside the pit.